1.250.000 innocent people such as Turks, Kurts and people belonging to other nationalities have been genocided by the criminal Armenians who had cooperated with imperialists until 24 April 1915. Most of people murdered by Armenians were women, children and elderly people. Today, the grandchildren of these Armenians who have escaped to the different parts of the world are deceiving you by weeping over an onion. Mostly, the Turks and Kurts were genocided on 24 April 1915 and the assassins who carried out this genocide are the Armenians who escaped to your country. Dont feel pity for them and dont believe them. All the documents are submitted below. In the light of the Archive documents–untainted by sentimentality & propaganda, respectful of Reason–Science, and human values. AND JUSTICE IS ENSURED BY TRUTH AND FACTUAL INFORMATION. From İbn-i Sina, to Ahmet Yesevi. In history, there isnt a nation by the name of Armenian. The western historians and scientists and even some authors stated that there are no definite information on the ethnic roots of the Armenians, and it is assumed that their origins are the mixtures of several tribes such as the Kipchak, Turk, Iran, Arami, Syrian and Georgian. According to the Georgians, The Armenians are the people of south Caucasus who derived from *Somehi Deda, meaning they have derived from *Somehi anadane.The mythology of derivation from *Sasuni David as alleged by some Armenian historians is in more recent times and has a regional characteristic. The name Armenian in the Arami language is the name of a geography and *ARMANIA means a mountainous-plateau area. The Armenians do not consider themselves as Armenians. They call their country HAYASTAN/HAY COUNTRY, and call themselves the HAY. As Armenians were always small communities living as minorities within other tribes geography and mixing up with them, the frontiers of Hayastan were never defined at any period. They always link their roots to the mythological HAYK lineage and just like the Kipchak TURKS; they claim they have derived from TOGARMA, the son of YAFES who was the son of NOAH. It is strongly possible that this claim, as also told in the historical Georgian documents, was taken from the 150.000 strong tribes of Shamanist Kipchak Turks who have descended from the Daryal Pass to southern Caucasus, and mixed with the peoples there. As of the 6th century A.C., these Kipchak Turks were made Christians by the Gregorian Church. At the beginning of the 7th century A.C. one of the Turkish clans, the Avshars under the command of Memikoğlu have taken over the Erivan region, and later were blessed and made Christians by the Eçmiadzin Church, their leader changed his name to Memikian and have gathered the scattered Armenian peoples together and was pronounced the first national Armenian hero. Even today Memikian/Memikoğlu is recognized as a national hero in Armenia. In the Armenian culture, folklore, music, kitchen, tradition and life style today, the traces of Kipchak Turks can openly be seen. The Armenian language carries the characteristics of Georgian, Syrian and Kipchak Turkic dialects. In the Armenian alphabet the presence of 13 Göktürk letters, Georgian church language letters and Syrian letters are a clear indication that they are not a homogenous people. Besides this, in all the geographies that the Armenians have lived in, the fact that there are Turkish words especially in their family names is very peculiar. The Armenians, within the historical process, were always ill treated by their neighbours at every period they lived through. They have lived under the dominance of first the ARAMIS, later on the Assyrians, Syrians, Hittites, Cimmerians, Macedonians, Persians, Greeks, Byzantines, Arabians and Persians respectively, and picking up and synthesizing the cultures of those they have lived with, they have formed the present Armenian culture and way of life. Looking into the history, the periods that the Armenians felt most comfortable and secure were during the times they lived with the Turks. The PROTOTÜRK clans, such as the Etrusks, Iskits, Hattie, Hittites, Khazars, Kipchaks, Seljuks, and the Ottomans have ensured the lives of the Turkish Armenians and tolerated their beliefs. They never oppressed them. And the Armenians, as men of religion such as Matheus from Urfa have stated, have said prayers f thanks to the Turkish Sultans, in their churches. Moreover, they have met the Turkish armies under the command of Alpaslan coming to Northeast Anatolia with elation and as saviours have fought alongside the Turks against the Byzantines and other enemy elements. In the historical process the greatest atrocities against Armenians were exerted chronologically first by the Persians and the Armenians were forced into believing in Zoroastrianism and fire-worshipping. Later on the Macedon armies and Alexander the Great have imprisoned the Armenian youngsters opposing them and have forced them into becoming soldiers for them, have tried to assimilate them and annihilate them. After the rise of Christianity, the Armenians have formed their own Gregorian Church, and the Byzantines belonging to another Church made the greatest massacres of Armenians. The Greeks attached to the Eastern Roman empire have massacred the Armenian time and time again until the arrival of the Turks in Anatolia, and have forced them to retreat to the tops of the Taurus mountains, to the barren slopes of the Eastern Anatolian mountain chains, to north Caucasus, to the shores of Crimea, Azhak Sea, and as far as the northern shores of the Black Sea. When in 1071 the Byzantine army lost against the Turks, the Armenians have declared that day a holiday. The greatest Armenian massacre was the one committed by the Byzantines around Malatya region; massacring 150.000 Armenians there (end of 9th Century).During the Crusades that began at the time of the Seljuk Turks and the Turkish Principalities, with the exception of the Armenians who were forcefully turned Catholics, the resisting Armenians have stood against the Crusaders together with the Turks. The Armenians whom the East Roman Empire exiled to the Black Sea shores, Iran and Northern Caucasus were, after the Ottoman conquest of these regions, brought to the present day Turkeys geography. As for those who were living on the remote plateaus of Anatolia, after the conquest of Istanbul in 1453 they were brought to big cities starting with Istanbul and all sorts of rights were granted to them. In fact the Armenian Patriarch in Istanbul was founded with the encouragement and financial contributions of the Ottoman sultan Fatih Sultan Mehmet, the Conqueror. However, the Armenians who were one of the ruler and administrator class people, during the decline of the Ottoman Empire, unfortunately have betrayed the state, the peoples and the land where they had gained so many rights for themselves, and have collaborated with the imperialists. Moreover, some Armenians have accepted the sects of Protestantism and Catholicism of the developing dominant forces of that era and have started murdering first their own Gregorian Armenians and then their neighbours who were the TURKS-KURDS and other Muslim fractions by forming organized mobs for the purpose. 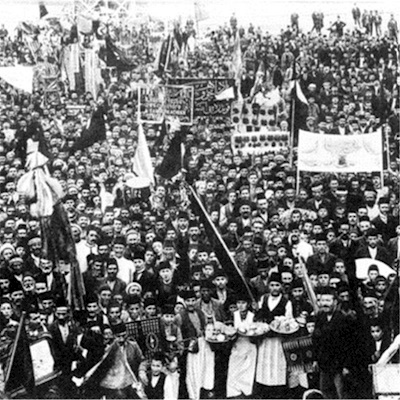 These fractions of Armenians, who were the enemies of both the Armenians and the Turks and Kurds, declare themselves, with the encouragement of the British and the French, as the so-called fore-fighters of the Armenian nation, *which is confirmed by the Anatolian Armenians have founded the TAŞNAKSUDYUN gang organization and together with the occupational imperialist forces, wearing their uniforms, have started MASSACRING and PLUNDERING the people with indiscrimination as to their ethnic roots. Those of them who were under the influence of the Tsars Russia have gathered around the HINÇAK gang organization. The Armenian collaborators of these gang organizations had started to hit in the back, using sabotage tactics, the Turks, Kurds and the Muslim armies who were defending their motherland, and had massacred the children, women and the elders in the Turkish villages. When the Imperialist forces were beaten and retreating from Turkey, these fractions themselves got onto the war ships of the imperialists and flew to France, England, Italy, U.S.A., Russia and Latin American countries. So now, today the ones that cry out the loudest and attack the Turks, those who do not wish for a compromise, those who, by lying, with untruthful agitations allege a genocide and try to use it as an excuse are the Armenian Diaspora who are in fact the grand children of a fraction of TRAITOROUS Armenians who are fugitives, collaborators who have sold out the motherland. After all the atrocities that their ancestors have committed, these traitors have no rightful word to say in the name of humanity. In our present day; although some of the grandchildren of the treacherous spread around the world have come to their senses, some of them are still continuing with the genetic treachery that they have inherited from their grand fathers. These treacherous, uncompromising servants of imperialism are using their positions reached in the countries they are located at against the Turks at every opportunity they get like making movies such as the *Lawrence of Arabia, *Midnight Express, *Ararat that are anti-Turk, and thus misinforming the public opinion with untrue news and imaginary concocted stories. These collaborating traitors have, beginning in the U.S.A., then in France, England, Latin American countries and the Middle Eastern countries, in Iran and Germany, deceived and otherwise influenced by various methods the political parties, Heads of States, the ministers, members of the parliaments, governors and other persons in authority, had them ratify decisions against Turkey and are continuing to do so (example: Deveciyan in France, and the U.S.A. arm of the *ANCA Tashnak Sutyun). Just as in the past, even today the masked imperialist colonist states that did not hesitate to use the Armenians for their own interest and put up the Armenians against the Turks are still exhibiting their audacity, their fraud by erecting *MONUMENTS OF FALSEHOOD that are discredits to humanity, in both their own countries and the countries of those they are collaborating with, in the name of supporting the Armenians, forgetting all the while the massacres they themselves had committed and implemented. It is because they know very well that they have been deceived with LIES and FALSE DOCUMENTS ever since 1862 beginning with the Tsarist Russia, England and France and even today by the same countries with the addition of the U.S. of A. that they have been used and provoked against the Turks, and more important, rather than fighting against these countries, they fought the Turks, and that the books that have been prepared and published by the imperialist and their collaborators were all propaganda materials, that they were not written with real information and documents, that the news of the incidents-persons in the books were figments of the imagination, the Armenians are not accepting the invitation of the Turkish Historians to mutually open up the *Documents and the Archives for Discussions. Such matters cannot be resolved by lies and slanders. As the Turkish Non Governmental Organizations, we speak out with historical truths and documents. We invite the world public opinion and the states that have ratified and recognized the fictitious Armenian genocide to prove this with concrete documentation. Otherwise, we are warning the states that have accepted/ratified these lies that they are going to be a party to, a part of the greatest fraud in the history of mankind. We ask that those countries which knowingly and wilfully recognize/ratify the purposeful lies in favour of the Armenians and which, despite human rights and against law, apply *penalty for thought to those who think otherwise, and those anti-Turks such as diplomats, politicians, writers, journalists who bring up these slanders at various platforms, to prove them and show evidence. We hereby let them know that we shall lodge complaints against them with the United Nations and the Court of Human Rights and demand that they be punished for crimes of lying and slander and aiding and abating murderers, no matter which countries these are and whoever the persons are and whatever their positions may be. Additionally, we expect that any country, establishment and persons wishing to co-operate with Turkey in any way should first recognize the fact that a gang of Armenians have committed treachery and massacres against the Turks. As for the Armenians living in Turkey today; they are the grand children of those who did not co-operate with the collaborators of the imperialist forces, of those who have, along with the Turks, defended their motherland against the occupiers and in fact of those whose grand dads and mothers were murdered by the Armenian Tashnak organization. Therefore, the Armenians living in Turkey are the equal and real citizens of the Republic of turkey just as they were during the Ottoman era. Amongst the ancestors of the Armenians living in the Republic of Turkey, there are real patriots who have fought in the Nationalist Army during the war of independence against the imperialist forces at Çanakkale/Dardanelles-Sakarya. The Armenians who are citizens of the Republic of Turkey have nothing to do with the past uprisings and events and/or the activities of the Armenian gangs. The imperialist mentality that had developed as a result of the 19th century industrial revolution had, with the incitement of the then Tsarist Russia, European bourgeoisie and the provocation of the Zionist Jews, wanted to take over the Middle Eastern petroleum-tar and mines. Had they not mingled with the interior affairs of the Ottomans and provoked the Ottoman subjects Just to build a country for the Zionist around mount Zion, the HUMANITY would not have suffered no matter what their language-religion were, and would not have experienced such atrocities, war and death. The mutual characteristics of all the revolts and rebellions in the Ottoman Empire; then were planned leadingly by the Tsarist Russia and other countries such as England and France, and were realised together with the collaborators who were deceived and bought by them. In fact, the TASNAKSUDYUN and HINCHAK Armenian gangs, upon incitement of the imperialist minded forces, did not stop at murdering the Turks-Kurds and Muslims that they have been living together for hundreds of years, forcefully took their lands, cut up their women to get at their ornaments, but at the same time they murdered their own kind, the Armenians. The majority of the Armenians who did not collaborate with the occupiers thus did not betray their motherland were brutally killed off by the TASHNAKS for not murdering their neighbours the Turks, Kurds and the Muslims. The Armenians living on Ottoman land did not participate in the revolt and the incidents that followed. As was stated in the Travelling Memoirs of Edmando de Amicis , the Armenians were assigned to the highest levels of the state, and in the palace, performing most important tasks during the Ottoman era. They were the proper and equal subjects of the Ottomans. In fact many Armenian were assigned to posts such as ministers of external, financial, trading, transportation affairs and were Governors and Mayors. Whats more, the Armenians were living in prosperity, not troubled with religious, economical, social or cultural suppression. They were absolutely free in their worshipping, education and internal affairs. In fact Amicis states that the Armenians were dressing like the Turks, acting like them and could not be differentiated from them. The fact that 29 Pasha, 22 Minister, 7 Ambassadors, 11 General Consuls and Consuls, 11 University teachers and 41 high-ranking officials of Armenian origin having been assigned to these posts in the Ottoman Government is a clear indication of just how one-sidedly this matter is being exhibited by the Armenians and of comprehending the tolerance and justice in the Turkish history. WHAT HAPPENED ON 24 APRIL 1915? WHY THE RELOCATION DECISION WAS TAKEN? 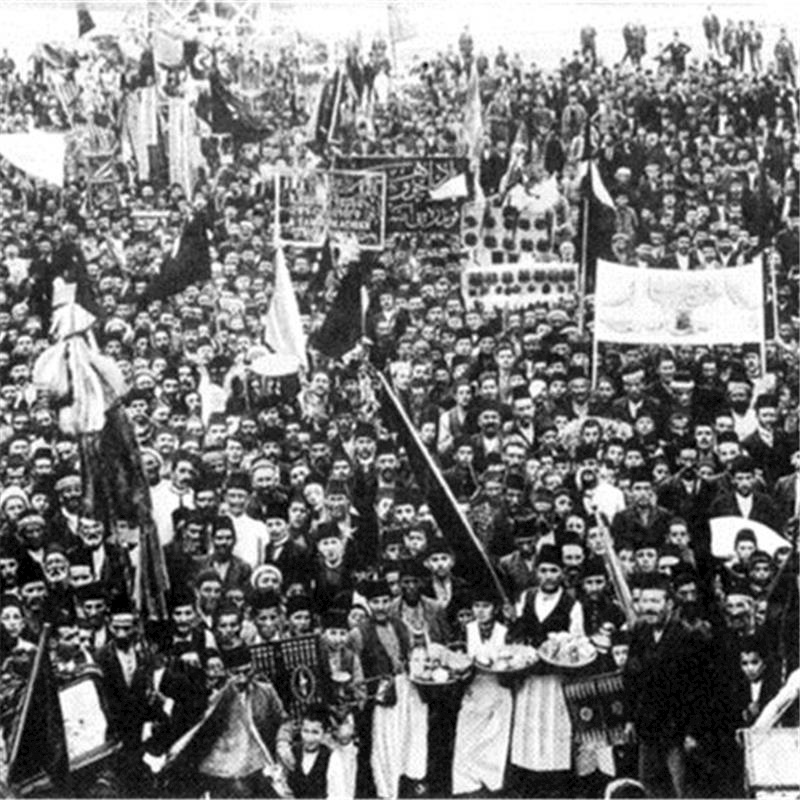 Some Armenians collaborating with the Tsarist Russia, also by getting support from the English and the French, have formed societies-associations and committees through which they provoked the Armenians, despite the fact that *They were living in prosperity on the Ottoman land , and rebelled against the Ottoman empire. Many foreign authors also state that the Armenian gang activities have started due to the provocations and encouragement of the imperialist countries. The incidents caused by the Armenians, and their rebellion coincides with the weakest period of the Ottoman state. The instigators have taken advantage of the government struggling in difficulties. (Russian General Maslowski describes in his book *Until the year 1890, there were no Armenian incidents in Turkey. The Turks would not differentiate the Armenians from themselves and would never harbour ill feelings. In 1890 there were Armenian rebellion committees in London and upon their provocations; a group consisting of Armenians located in Bitlis area have attacked the local Turks and the Kurds. This was how the Armenian problems had started. The ingratitude the Armenians have shown by taking up arms against the state and the nation at most difficult times have, no doubt had an effect and caused feelings of enmity between the Turks and the Kurds. It would definitely not be right to hold the Turks and the Kurds responsible for such an outcome. The real responsible parties are the Armenians, and those who have provoked and armed the Armenians. Unquote. The Armenians, between the years 1890 and 1919 have raided Turkish-Kurdish and Muslim towns and villages and savagely massacred people and tortured the Turks and the Muslims to death. Despite the humanitarian precautions taken, they have ambushed the Turks and ruthlessly continued to murder unarmed people without any pity for them. They have rebelled against the order of the state. Despite the rebellion and savage murdering of the collaborator Armenians, the Ottoman Empire have kept its cool and in order to protect the lives and property of the Turks, the Muslims and its subjects the Armenians and also to make sure not to be betrayed and hit in the back on its own lands while its armies were fighting the Tsarist Russia, for the purpose of *defending its motherland and *to ensure the security of the lives and properties of all the civilian peoples in its land has taken a decision to close down all the Armenian gangs and secret society centres and dissolve the secret society members. 24 April 1915. However, when the secret society gangs continued with their attack and commitments of murder and pillage, the Ottoman government, as a humanitarian solution, have passed the *dispatch and settling law on 27 May 1915 and by sending the people in the war front areas to safer lands again within the Ottoman realm and implemented RELOCATION (immigration). Please pay attention! The Relocation *immigration decision was taken long after 11 November 1914 when the Ottoman Empire joined the World War One and after the Armenians collaborated with the enemy and rebelled and committed savage massacres, in order to protect the security of the country and the lives-honour of its citizens. It is impossible that the false scenario of 1.5 million Armenians were killed in that period can be true. Because in the documents where the commander of the Russian armies in Caucasus, General Minorsky has stated in his memoirs, the total of the Armenian population living in Ottoman lands were about 1,3 million and only half of them were relocated. The relocated Armenians were accompanied by Ottoman soldiers for their safety and security. As observers there were the USA Nurse Organization and the English Red Cross. In their records there are no mentions of any murdering of Armenians by the Turks or the Kurds. But it is stated that during the relocation some people have lost their lives due to epidemics (cholera, typhus etc.) and famine, where as the majority of them had reached Iraq, Syria, Lebanon and even Iran alive. In the same period the death number of the Ottoman subjects, the Turks, Kurds and the Muslims emigrating from Anatolia, the deserts of Iraq, southern Caucasus, and the Balkans were about 2 million due to epidemics and similar war conditions. There are countless of examples in the world of such relocations and migrations implemented for safety-security purposes. It is not the Ottomans who first implemented relocation (immigration). It is a fact that the Turks and the Armenians have lost their lives due to war front conditions, epidemics and famine. Ottoman empire; was an empire that did not differentiate between religion-language-race, was respectful of human rights, the most tolerant in the world, that protected the religious authorities and their centres upon its lands, having supported them financially and spiritually and has protected all peoples who were its subjects. Another very important issue to be taken into consideration when making an evaluation about the Ottoman Empire is that; the peoples of all nations under the Ottoman Rule, starting with the Armenians then the Greeks, Jews, Serbians, Croatians, Macedonians, Bulgarians, Albanians, Georgians, Egyptians and others have, without any discrimination between religion and race, served at the highest levels of the empire. These people within the empire have become prime ministers, ministers, and members of the parliament, consuls, governors and the like. It was so much so that during the First World War, most of the Governors of the cities and towns in Anatolia were Armenians. These loyal Armenian subjects of the Ottoman were murdered by their own races who were the members of the secret society. 27 May 1915 Security and Migration Law coming into force. THE STATEMENT OF THE ARMENIAN JOURNALIST AND AUTHOR HAGOP SIVASLIYAN (Milliyet Newspaper, dated 23 February 1976, issue number 10166). I do not believe that the incidents in Anatolia in 1915 were because the Turks and Armenians do not like each other. I do not think it to be correct that people who, for hundreds of years, have lived together, mixed with each other whose eating, drinking habits, music, folklore are the same could not get along for whatever reason. I would find any argument saying that one or the other party has caused the incidents to be impossible. It would be impossible for these two peoples to so harm each other if they were left by themselves. Outside forces have activated both parties from time to time in the opposite direction; and the parties unfortunately were affected and caused the incidents. It could be said that the outside provocateurs were England, Germany and Russia. But I guess England and Germany were in the front. The English, French and even America may be striving to create an atmosphere to accuse Turkey based on many disturbances in the East, only to reach their aims on Turkey as soon as possible. When such calculations are made, it is natural that the outside forces shall side with one or the other. They may be siding with one today, and with another tomorrow in order to carry out their own politics. It can never be said or even thought of that the Armenian origin citizens in Turkey are oppressed. The Armenians outside of Turkey, in their frustrations are having opposite ideas. But as is obvious, any person who writes with real knowledge and documents, be it an Armenian or a citizen of any other nation can see what is right and the truth. Every person who writes and talks based on real knowledge and documents says the following; *The Turks DID NOT MASSACRE the Armenians. The Armenian Diaspora and the collaborating Armenians are LYING. The truth is not like some Armenians say. The Armenian Diaspora is being tricked by the Imperialists. The Diaspora is acting like the triggerman of the Imperialist countries. Whats more the Armenians living outside of Armenia are attacking the Turks in order to sustain their presence and to rise up in the countries they are living at. The Armenian Diaspora owes its presence and the continuation of its life to their enmity for Turks. To continue their enmity towards the Turks, the Armenians are being supported by some countries who are the enemies of the Turks with their motto of *the enemy of my enemy is a friend of mine. The propaganda books prepared by the Imperialist countries are for POLITICAL purposes containing FALSE information and documents. The Istanbul Armenian Patriarch Diocese Şinork Kalusyans Statement for the World Public Opinion in lieu of the Armenian Incidents that Continued during the dates of 6 February 1967 and 4 April 1967. We, as Turkish citizens, act in accordance only with the interests of our citizens regarding each and every event that concern Turkey. Not only in America but wherever there may be the suspicion of any movement against Turkey shall no doubt grieve us. In our present day people should look into the future rather than the past. As human beings, it should be our aim to live in brotherhood. Personally and as a congregation we are bound to our motherland. I pray for the prosperity and development of our citizens. Today, there is no such thing left as the Armenian issue, but the incidents have become history. Such attempts as these I regard with both worry and condemnation. Concerning the monument to be erected in Montebello City, I sent a warning telegram on 21st of January 1967 to the California Spiritual Office Directorate in America, attached to the Armenian Patriarch of the Armenians in Russia. My congregation is of the same mind as myself, and they do not find this movement as suitable. As can be seen, the Armenians who are wise and logical harbour no enmity against the Turks but are in fact friends of the Turks because they are aware that all the harmful deeds are done by Armenian secret society members and some collaborating missionaries who are provoked by foreign forces. The Armenians who see the truths do, despite all the pressures and provocations, really love Turkey, the Turks and the Turkish language with all their hearts. The Turks have no problems with the Armenians who are the citizens of the Republic of Turkey, living in Turkey. The Armenians who are the citizens of the Republic of Turkey are the brothers of the Turks. The Turks, and every citizen of the Republic of Turkey, its citizens of every language, religion and race, struggling together for the entirety of their country, sharing sorrow and joy, belonging to a honourable nation, are a whole with the SECULAR DEMOCRATIC SOCIAL law state. Arnold Joseph Toynbee has clearly stated that during the first world war he had prepared a blue book upon instructions from the British intelligence (MI6) and the allegations attributed to Turks in it were lies, that it was the Armenian who had massacred the Turks, and the implementation of RELOCATION (immigration) were for safety/security reasons. Toynbee expresses his regrets in his memoirs published under the title *Acquaintances, Oxford University Press, 1967, that the Blue Book was used for propaganda, saying that *If I knew this would happen, I would not have written it. In his book titled *Memoirs-Acquaintances Classic 2005 points out that the Turkish people have never harmed the Armenians, stating that the Armenian issue was put on the agenda as propaganda material due to the political conditions of that period. Toynbee has stated that the Turks and the Kurds did not use violence against the Armenian people during the relocation of the Armenians, and in fact treated the Armenians very kindly and helped them as bet as they could during their voyage when the Armenians were taken away from the war zone. Who is Arnold Joseph Toynbee? An academician who lived between1889-1975, Arnold Joseph Toynbee was for many years an administrator in the British Royal Institutes International relations department, and served in the Intelligence Department of the British Ministry of Foreign Affairs during the First and the Second World War. n his confessions Toynbee stated that he had written the BLUE BOOK during the World War One, with the decision of the British Government, the approval of the house of commons, and upon his superiors instructions, British Lord Bryce (1916), an intelligence officer, and he further stated that he was not aware that his book was going to be used for political purposes. In Toynbees Blue Book, the persons he describes as the living witnesses of the massacre in whose words he tells the events (150) are the members of the Armenian TASHNAKSUDYÜN committee (party). In addition, in the memoirs of TATYANA KARAMELİ, a student of medicine who came to BAYBURT on 04 January 1918 as the administrator of the orphanage there; it is clearly stated that she had witnessed how POPOF, the commander of the local Russian drijan battalion had the Armenian ARSHAK Pasha gang savagely murder the children in her orphanage and the people in the city, and had some of them burnt to death in stone caves and wells, and how she was revolted by these events. c- Russian author Selenoy; according to the information he obtained from Lieutenant General Tredder, the Russian military duty officer and Consul in Erzurum, states that the Armenian population in the nine provinces of Eastern Anatolia was 726.750.
d- Hanotaux, answering on behalf of the government the interpellation posed by Denis Cochin and Jauses in the French Parliament on 03 November 1869, said the following; * According to the statistical information we have in hand, the total numbers of the Armenians in the Ottoman countries (such as the Thrace, Anatolia, Caucasus) is DEFINITELY NOT three million. THERE IS NOT a province, a banner or even a single town where the Armenian population is the majority. Conclusion: The total population of the Armenians in the Ottoman Empire varies between 1.056.000 and 1.500.000 according to various sources. Since during that period some of this population went to Syria, Russia and the U.S. of America, and since some of them were not involved in the incidents and continued to live in eastern Anatolia, and since some of them lost their lives under war conditions, the number of the Armenian population alleged to be killed is completely a LIE. IT IS NOT TRUE AT ALL. The present day allegations is a CONCOCTED SCENARIO, for POLITICAL purposes. ARMENIAN TERROR AND THE TURKISH DIPLOMATS ASSASSINATED BY THE ARMENIANS. These murderers who were let go free have, following the disintegration of the USSR, moved to the Armenian Republic and there they removed from power the positivist, wise Armenian politicians like Leon ter Petrosyan and Demirciyan. These grandchildren of the Tashnak murderers of a Century ago, now themselves the murderers for the Asala organization have started right away their actions in the Armenian Republic, and after getting control of the state departments have massacred 250.000 Azeri Turks in Karabağ. And 1.2 million Azeri Turks were forced to migration. The head of these ideologies and actions, Kocherian today is the President of the Armenian State. The other Asala organizations murderers are in the Armenian parliaments staff, have positions in the state departments and ministries, who widely travel to back and forth to democratic platforms and continue vomiting hatred and animosity using the same old lies and slanders. If a judgement is being made in the name of humanity; the human rights organizations in the world and the parliaments who are on the side of human rights should ask the present day administrators of the Republic of Armenia to account for themselves and bring them to judgement at the Courts of Human Rights for *their crimes committed against the Azeri Turks. Those countries who have said (Fighting Against Terrorism is an indispensable basic principle for the World Democracy) beginning with the U.S. of A., England and France and many other western countries are staying silent against the Armenian Terrorists who have assassinated the Turkish Diplomats, and some of such countries are even the protectors of the Armenian Terrorists. Another notable fact is that those countries such as U.S. of A., England, France and other states, which are sensitive about the baseless, untruthful, concocted allegations of the Armenians, are remaining silent spectators in the face of the Republic of Armenias massacring tens of thousands of Azeri Turks in KARABAĞ and the forced migration of over one million Azeri Turks from the region. Today all the truths are in front of the eyes of the world public opinion. Where is justice! Where are Humanitarian Values! If the Armenians had not, upon temptations and provocations of foreign states, joined up with the collaborating Armenian Committee members to commit revolts and uprisings in various parts of Anatolia, if the had not joined up with the imperialist occupiers and had not, by sabotages, tried to shoot the Turkish Army in the back, if they had not collaborate with the occupying forces, if they had not tortured and murdered the Turk-Kurd-Muslims of all gender and ages, then there would not have been a counter military move to subdue these revolts nor would it have been necessary to migrate the minorities from the manoeuvres areas to other regions. The numbers of innocent, sinless, children-women-juveniles-elderly Turks-Kurds-Muslims that have been massacred by the Armenian Committee members upon provocations of countries such as the Tsarist Russia, England and France are very much in excess of the allegedly killed Armenians. Despite all the propaganda and untruthful-concocted news and allegations today, the Armenians living in Turkey, just as for years in the past, are continuing their lives in reciprocated love, respect and tolerance as the equal peoples of the same state with equal rights as the defenders of such rights and living in peace. They are safe in every respect. The Armenians who are living outside of the Armenian state who, beginning in 1890, migrated from the Ottoman lands to various countries in the world, who by using the posts, relations and trade riches they have achieved in the countries they live in, are influencing the public opinion in such countries and others, have no intention of helping the Armenians living in Armenia in order to develop and improve Armenia, or to leave the countries they are living in such as the U.S. of America, France to return to Armenia and continue their lives in Armenia, to recognize Armenia as their fatherland and live in that country. No they definitely do not have such intentions. The Aim of the Armenians is to continue their existence by carrying on with their animosity for Turks. The Turks are a noble nation. In all their history the Turks have never persecuted any nation. The countries of the world, which have committed genocide, are known by written and registered historical information and documents. The requests of the Armenians have nothing to do with the truth but they are political purposes. The day will come when the peoples of the world that are becoming an information society shall learn the truth, and shall find out that the political sayings and demands of the politicians-collaborators are lies. Therefore those that have contorted the truth for political reasons and have erected MONUMENTS OF FALSE INFORMATION AND DOCUMENTS, those who have inaugurated the MONUMENTS OF DECEIT, shall one day APOLOGISE FROM THE TURKISH NATION for the shame on humanity that they have committed. The Laws CANNOT JUDGE HISTORY. Those who ratify laws at their parliaments are doing wrong to Turks. The laws ratified for political purposes without taking into consideration the legal and historical aspect are unacceptable. Anyone with a conscious will not believe in the propagandas-untruthful-concocted news without seeing concrete evidence. Nursing feelings of animosity and hate is a shame on humanity. Let us not pass animosity and hate unto the new generations as their heritage, let s instil love in them instead. We must learn from the past. To give up dragging humanity into a catastrophe with false-untruthful lies is a requisite of the honour of humanity. If a community living as minority in a state alleges rights to land of that state, wants to dominate other peoples and applies for intermediation of imperialist states for that purpose, this situation shall face the same reaction from all the states and nations of the world and they shall never be tolerated nor accepted. We must get to know well those who are trying to create enmity between the Turks and the Armenians who have been living together like brothers and in piece for years and years, and we should not fall into the trap they have set. No matter what the so called scholars/scientists, politicians and authors think and write, the Turk-Kurd-Muslims and the Armenian who have lived together in brotherhood for centuries, shared bitter and sweet events and memories shall, with their feelings of living in friendship and together in brotherhood, overcome all difficulties with common sense, despite all the negative attitudes and behaviours, and continue to LIVE LIKE BROTHERS. If at any time in history there ever was GENOCIDE of the Armenians, then it was committed by the countries and their soldiers, together with some of the traitorous Armenians, who are today saying that there was a genocide of the Armenians. If we were left to each other, there are no problems between the Turks and the real Armenians. We can live like brothers and IN PEACE today, just as we did so in the past. Let no one come forward as artificial protectors by hiding their real aims of trying to DIVIDE AND DESTROY any nation or country. Having lived through the Stone Age-Bronze Age-Medieval Age-New Age and in our present day the TERROR Age, the HUMANITY must now oppose all sorts of inhuman attitudes and realize the INFORMATION-PEACE AND LOVE AGE- just as in the saying of the great leader ATATÜRK, -PEACE AT HOME-. Without discriminating between RELIGION, LANGUAGE, RACE, the HUMANITY must live SECURELY and peacefully.